The Ms. JD Honors Law School Chapter Award is presented annually to a chapter that advocates the advancement of women law students through chapter initiatives, programming or recruitment. Quinnipiac University School of Law students Nicholle Maille of Somers, back left; Jessica McDade of Stoughton, Massachusetts; Rebecca DeBiase of Stratford; Taylor Matook of Exeter, Rhode Island; Kaitlyn Hennessey of Ansonia; Molly Martin of Old Saybrook, front left; and Katelyn Day of Meriden are members of the Women’s Law Society, which was recently awarded the 2018 Ms. JD Honors Law School Chapter Award at the Ms. JD Honors Reception at the UCLA School of Law. Contributed photo. Quinnipiac University’s Women’s Law Society was recently awarded the 2018 Ms. JD Honors Law School Chapter Award at the Ms. JD Honors Reception at the UCLA School of Law. 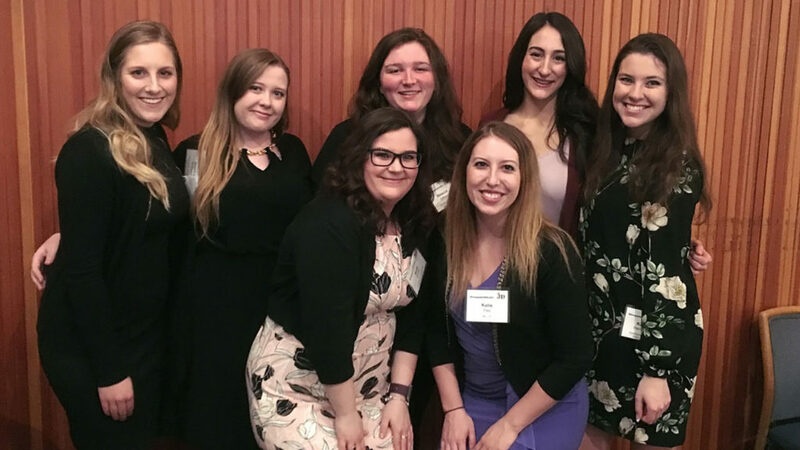 Quinnipiac’s Women’s Law Society, which became an active member of Ms. JD in 2016, is dedicated to supporting women in the profession and promoting diversity through its all-inclusive approach. Ms. JD, a non-profit founded in 2006, seeks to support and improve the experiences of women law students and lawyers. The organization strives to give voice to why it matters that women continue to overcome barriers to achieve gender equality in the profession.